Brick Waterloo Dark Lager | Brick Brewing Co.
Looks dark, tastes light. It's Ontario's favourite dark lager. A dark beer that is slowly brewed with Canadian grown malted barley, specialty coloured malts, imported hops and pure cultured brewers yeast. Dark lagers are enjoyed all year long, and they're not as filling as ales. Waterloo Dark will cut some of the heaviness in sauce-based meat dishes. 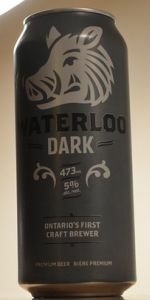 Waterloo Dark is an equally perfect beer to go with appetizers suitable for watching sports games, or used as an actual ingredient when preparing a meal. Experience what this great dark "light tasting" lager has to offer and why it has won multiple awards at the World Cup of Beer, Canadian Brewing Awards, Ontario Brewing Awards and the Monde Selection International Institute For Quality Selections. A- This one pours a nice dark brown color with a head that is pretty much non existent....instead, it is a fizzy thin layer that only covers a portion of the liquid and then disappears rather quickly unfortunately. The liquid is clear and with red hues, along with being quite clear. Carbonation seems to be thin and the lacing is pretty much devoid of life....not a great looking lager. T- This doesn't do much for me personally.....while it does contain some sweetness, caramel/toffee flavors and chocolate, it is very weak and underwhelming. Grassy, dry and somewhat bittering on the finish, this just is a little too clean for me....I suspect some rice/corn was used in the boil. M/O- This is light bodied, well carbonated (which is fine for this style) and is highly drinkable.....put it this way.....it is very much like a slightly bolder version of a macro lager. I would probably try it again but I most definitely will not be seeking it out on purpose ever again.....above average swill. This is a delicious example of an accessible dark beer for the average palate. While it will not be a favourite of the most hard-core fans of dark lagers, it is of admirable quality! Much more interesting than the average Brick beer. The rich brown colour and creamy head is appealing, its smell nutty (though not overpowering), and its taste leaves little to be desired. Feels a little thin in your mouth, but goes down like a dream come true! Some friends swear by this beer, figured I'd give it a shot and check another off my Ontario Craft Brewers list. Poured with a large tan-coloured head that survives as a collar about 15 minutes later. There was no lacing at all. I rather like the colour, it's a ruby-burgundy-cherrywood colour when held up to the light, a nice contrast to the head. The aroma is quite sweet, like roasted malt and molasses, with a certain nuttiness to it. Falls a bit flat, but it does smell fresh. I get a rich and sweet taste, like chocolate toffee. There's a bit of a tang in there, but no real dry or bitter balance to it. Again, a bit flat. The mouthfeel is pretty thin, even for an Ontario dark beer. There's a fair amount of carbonation in there and I get a sort of toasted resin aftertaste. Really easy to drink and accessible to people that may not like "dark" beers, but too thin and overly sweet to be a regular in my rotation. Appearance: It has a nice ruby/brown colour to it. It has a nice beige head that dies down moderately and no lacing. Smell: The aromas give out hints of grains and a sweet maltiness but not much else. Taste: Like the aromas, it has a sweet grainy and roasty malt feel with faint notes of caramel. Bearly no hop presence. Mouthfeel: It has a high carbonation with not so good of a balance. Drinkability: It's a very smooth drinkable beer accompanied with pretty bland flavours and aromas. Cold beer store special, tall can out of a bucket of ice. Good amber brown, clear with a soft creamy light tan head. Loads of brown sugar and caramel notes on the nose with a little spice. The taste is honey lager and medium roasted malts. The mouthfeel is slightly dry with a light body and a miner bitter finish. Over all, not bad for a Lager. Quite refreshing and an easy drinker but a perhaps a tad too sweet. A: practically opaque dark cola. S: simple, pine, yeastiness. Simple lager smell. T: Not much maltiness. Close your eyes and you couldn't tell it has a speck of dark malt. Clean, simple. Not much there. Noticeable bitterness and maybe even some sourness in the finish. O: Bias declaration: I just don't see the point of dark lagers. Either buy a lager or buy an ale. A dark lager tries to be both and ends up being nothing. Last time I try one. Appearance- Pours a dark brown (almost cola) with a finger width of bubbly head that fades quickly. Smell-plum, tad roasted malts. Not much else to the aromas. Very off putting. Taste- There is a little bit of the roasted malts and not much else perhaps some sweetness. Very peculiar flavours. Mouthfeel- Light to medium bodied with light carbonation. Thin and watery. Overall- A sub par Euro Dark Lager (if this is what its trying to be). Unpleasant aromas and bizzare flavours make this almost a drain pour. Disappointed and hoping to try a better representation of the style in the future. S: Skunk, sourdough, offal, cheesy. T: Bready, then a slightly clean linen but one that’s slightly cheesy, a yeasty clean slightly dough finish. Much cleaner than the scent. M: Medium body, medium low fine bubbled almost foamy carbonation. O: A little cheesy on the nose, flavor is not too bad and mouth feel is fine. Not too bad overall. Brick Waterloo Dark Lager from Brick Brewing Co.